Do you hate to miss important business calls? It seems like you only have to be out of the office for five minutes to get several phone messages, doesn't it? How do you deal with it? An old fashioned answering machine was state of the art in it's time, but is it right for today's fast paced business world? Why not check out the latest technology and find the perfect voicemail device? Panasonic 2 port TVA50 Voice Mail System (than can expand to 6 ports) may be just what you are looking for! 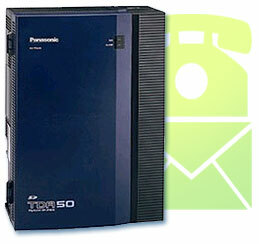 At TWAcomm.com we have several Panasonic products, voice mail included. You can see photographs of them, read about all their functions and check the prices at the same time. When you find the Panasonic voice mail product you want, you can buy it online and save yourself the hassle of driving to a store.